Depending on where you live in the UK, the Three Peaks Challenge can mean different things. If you’re in Yorkshire, then it’s the three peaks at the head of the Ribble, up in the Dales, comprising Pen-Y-Ghent, Whernside and Ingleborough, completing the trip in under 12 hours. If you’re not in Yorkshire, however, it can refer to the National Three Peaks Challenge, which means climbing Scafell Pike, Ben Nevis and Snowdon in just 24 hours for all three (that time applies not just to the climbs themselves, but also the driving between the peaks, making it a very stiff challenge, since there’s at least 10 hours’ driving involved). Considering that you need to take four hours to climb Snowdon, and five hours each for Ben Nevis and Scafell Pike, completing the National Three Peaks Challenge in 24 hours takes some doing. That you need to be fit is a given, since, although the time estimates aren’t too gruelling, the endurance involved is, especially with so much time in the car (it’s suggested that any team has a dedicated driver). 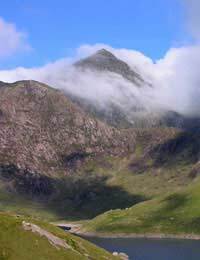 Summer, with its long daylight hours and better weather, is best for this, starting early in the evening with Ben Nevis, followed by an overnight drive from Scotland down to Scafell Pike, meaning that two of the peaks can be climbed in full daylight. Alternatively, one can start very early at Ben Nevis, meaning that the Scafell Pike walk will end in the dark, and the Snowdon hike undertaken in darkness. This works well for many people, but the former does offer some advantages for driving, with the emptier night time roads. Whichever way you do it, it’s always a race against the clock, not so much for the walking itself, which only takes a total of 13 hours, but for the lengthy road trip, where conditions can be out of your control. Thankfully, there are no frantic cross-country car dashes for the Yorkshire Three Peaks Challenge, but there is a lot more walking – and, perhaps surprisingly, it remains an unofficial challenge. The place to begin is Horton-in-Ribblesdale, which is also where you end, since the route is circular, going to Ingleborough, then Whernside, and finishing on Pen-Y-Ghent, which together are the county’s highest hills. To realistically undertake the challenge, you’ll need to be very fit, with experience on the high hills, and it should certainly never be undertaken alone, since the weather can turn quickly (which means at least one on the group will need excellent navigational skills and know what to do in emergency situations). However, there are places en route where you can buy hot food and drink (in Ribblehead and Chapel-Le-Dale) and even give up if need be. Given that the walk is 25 miles, much of it a hard slog over difficult terrain with some steep climbs (a total of 5,200 feet), it’s not for the faint of heart, especially with the 12 hour limit to meet the challenge. It’s hill walking, but the extended period makes it very hard for most people – you have to keep going. Again, because of the length of the walk, summer is best, so it can all be done in daylight, and to take advantage of better weather. Believe me, the Yorkshire Three Peaks walk is a very serious, gruelling challenge. I've tried it twice and not managed it - I simply can't cover 25 miles up and down hill in that time, and I greatly respect anyone who can, they deserve loads of credit. As to the National Three Peaks, well, at least you can sleep in the car, although I don't know if I'll ever be ready to try that one. If I was 20 years younger, then maybe, but now...I'd never manage it!